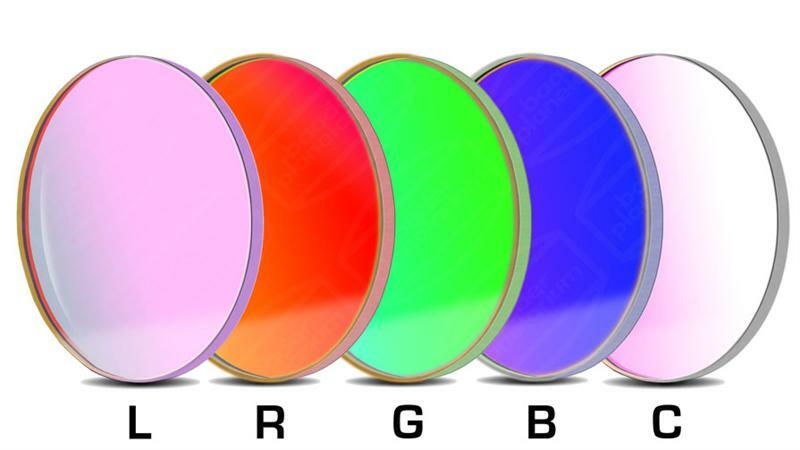 Simply put - Baader's new LRGBC anti-reflection filters deliver improved color separation and image quality without annoying halos. Unfortunately, their obvious improvements will likely cause many astro-imagers to re-take images of their favorite objects. What makes the Baader filters so unique? Through an extensive coating stack design and testing program, Baader has partnered with the world's leading thin film coating company to produce transmission curves that border on the ideal. 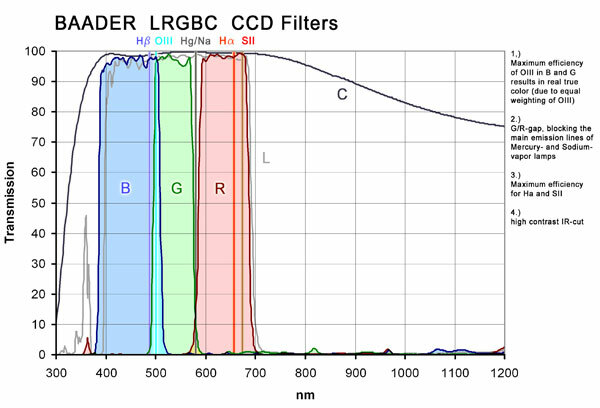 Their ultra steep cutoffs and high transmission (>95%) allowed Baader to do something to a degree no other RGB filter set can manage - they are able to effectively separate the important H-Beta and O-III lines. The Baader Blue filter passes virtually all of the H-Beta and O-III lines, while the Green filter is able to capture all of the O-III line, without encroaching into the H-Beta line. None of the light is wasted by either filter. In this way, O-III is represented as it should be, a teal (blue-green) color, and H-Beta is captured solely in the blue. Never before has this degree of separation been achieved, and with such high transmission of both lines. In addition, the Green and Red filter passbands nearly touch, leaving only a sharp notch to block out the primary Mercury/Sodium light pollution line at 580nm. The high transmission everywhere else delivers the shortest combined exposures possible with every detector. In addition to their special transmission properties, the Baader coatings were developed from the outset with another key goal in mind - eliminate the annoying reflections present in other astro-filters. To achieve this freedom from reflections required careful balancing of the coating stacks and further extensive testing. 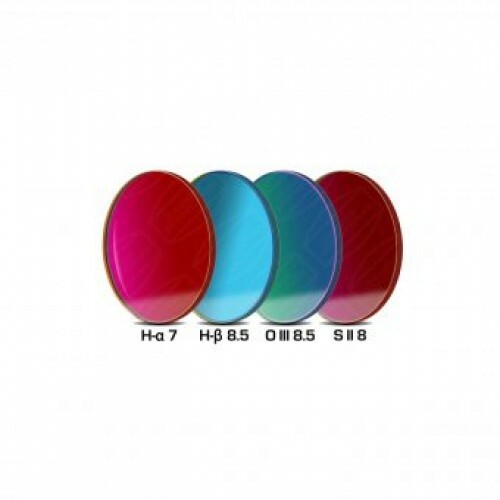 The high optical quality of the Baader narrowband filters guarantees no loss in sharpness or contrast. Each substrate is fine-optically polished plane parallel to deliver a smooth and accurate 1/4 wavefront over the entire surface. Each filter is blocked and polished individually, not cut out of a larger plate of glass. The special custom polishing operation sets Baader filters apart from the lower optical quality provided by standard commercially precision polished filter substrates used by most other filter manufacturers. Coatings are professionally applied in Germany by the most sophisticated equipment available today, ensuring high consistency for bandpass cutoffs, transmission, and out of band blocking. The anti-reflection coatings are evenly balanced on both sides of the filters to reduce surface stresses and prevent deformation of the substrates. The ultra-hard ionbeam deposition ensures the coatings will never degrade from use or normal cleaning. Unlike many competitive filters, Baader coats each filter individually. Baader filters remain sealed at their coating edges for a long life without degradation (you can see evidence of this process by inspecting for a thin un-coated region at the very edge of the filter). Though more costly, this process avoids the coating failures that can result when filters are simply 'biscuit cut' from bulk coated sheet glass, leaving ragged coating edges for moisture to penetrate and cause coatings to peel away from the glass. Baader filters are intended for a lifetime of real-world use.